George Square, Glasgow, today’s update. A bit of a lull on new consultations following a busy few weeks, but please make sure you respond to the ones of interest to you. The East City Way will ultimately be a 7km fully bidirectional segregated cycle lane running from Mount Vernon past Parkhead and the Chris Hoy Velodrome up to the existing lane on London Road. We have been really pleased to see more safe segregated cycle lanes being proposed for Glasgow, and especially glad to see this now happening in the under provided for area of the east end. Plans for segregated cycle lanes always need our support and so if you have a couple of minutes, please fill out a really quick response here. The survey is very simple with only around four check boxes asking whether you are in favour of certain aspects of the plans. We have answered yes to all of those and have added that we feel that if traffic calming is added, that it should be in conjunction with making the area a 20 mph zone with associated enforcement. We have also sent in this letter of support which also makes a couple of suggestions on how the current Mount Vernon junction might be improved for cycles crossing. We have also reiterated that while we would never object to bidirectional cycle lanes, and appreciate that gathering support for them is easier, we hope that uni-directional lanes are always considered as the first, safest, and best quality option. Do please answer the quick survey! The scheme is aimed at improving road safety by reducing vehicle speeds. Please provide any comments you wish to make on these proposals within 21 days. In the meantime, should you require any further information or clarification on any points arising from the proposals, do not hesitate to contact my assistant Sandy Carle on 0141 287 8205. A local GoBike member has told us that the measures have been proposed to deter “boy racers”. In the past when boy racers were disturbing a central area of the city, it was proposed to break the circuit they drove in, but we are not aware of any such measure being proposed here. Could Albert Drive to the west of Shields Road be stopped up to cars but with access maintained for bikes? Could the wide road conducive to speeding be narrowed by installing bike lanes using orca-type separators or planters on each side of the road? That would stop the footway parking too, and parking bays on the outside of the bike lanes would further narrow the road. This western part of Albert Drive has a 30mph speed limit, which would become 20mph if Mark Ruskell’s 20mph bill is approved in the Scottish Parliament. STOP PRESS: an improvement to the Traffic Calming plan. On Friday Tricia spoke to the engineer who had designed the traffic calming layout and, although the above plan does not show it well, he had allowed a 0.5m gap near the kerbs to allow bikes to bypass the speed tables. Further to the discussion a new drawing has been issued to us today, Albert Drive TC amended detail and this gap has now been widened to 1.2m, which will allow not just a standard bike but cargo bikes and tricycles to avoid the speed tables. This is a big improvement, although we would still wish to see cycle lanes …. This is a survey with a difference; it’s about travel connections in the south west and it is specifically aimed at people who live and work there. However, I’ve responded on a personal level on the grounds that this is an area that’s difficult to get to by public transport, if you wish to then tour by bike. Until there is a better train service or provision of buses with space for bikes, then this area is missing a significant tourist market. You might wish to respond too. We introduced this in Digest17 item 1.8. Please do respond to this but also please look at the Cycling UK request to write to your MP. We need a full review of all road transport offences, rather than a kneejerk response on cycling only. We are hopeful that we will soon start to receive notification of East Renfrewshire consultations. Our co-convenor recently e-mailed a contact we have in the council to voice concerns from several of our members that recent removal of the urban clearway restrictions on the cycle lane on the A77, Ayr Road, could lead to vehicles being parked in the cycle lanes during commuting times, thus adding potential hazard to people’s commutes. We were aware that there had been some consultation on this, which we were not party to, but we have now formally asked to be added to the list of consultees. If any of you out there in East Renfrewshire or other council regions within the Greater Glasgow areas do hear of consultations that might affect your cycling, please get in touch and let us know. We’ll see what we can do. “At Neighbourhoods, Housing & Public Realm policy committee this week, I had an amendment passed which will ensure that, in response to overwhelming consultation responses, future Byres Road proposals will prioritise fully segregated cycle lanes for the entire road, and air quality monitoring will be done before new plans are finalised. We’ll keep you updated on the future proposals. The response to the Traffic Regulation Order and the views received from the developers, given in Digest17 items 3.1 and 3.2 with their insistence that they did not wish to redevelop the area with the three-lane Clyde Place next to the site, should make an improvement to the area. Not a consultation, but some good news from Glasgow City Council’s website that they are to work with the owners of the river walls to improve their condition: https://www.glasgow.gov.uk/index.aspx?articleid=23230 This will certainly improve things along the Clyde and who knows, we might even soon have a river front to be proud of. I refer to your support of the above named Traffic Regulation Order and can advise that your support was reported and considered. The Council have decided under its scheme of delegated functions to proceed with the proposal as advertised. The Order was made on 28 September 2018 and an advert will be placed in the Evening Times on 5 October 2018 stating that the Traffic Regulation Order has been made. We pointed out in our letter that it is a shame that instructions in the Highway Code, in this case not to park opposite or within 10m of a junction, need to be reinforced by a Traffic Regulation Order, paint on the road and street signs. Ah, if only we had more traffic wardens…. Not necessarily a consultation, but here’s a link to a report, which Neil L pointed us to, http://www.brake.org.uk/media-centre/1843-report-finds-insufficient-government-leadership-and-funding-for-road-safety-over-past-decade which includes the finding “Road safety is not perceived as core business by all responsible agencies.” I don’t think that will come to a surprise to many of us, but it does help to explain the lack of coordination by Local Authorities, who bring in 20mph speed limits, and Police Scotland, who aren’t resourced to control them, let alone parking changes, which are managed by the local authority itself. Over the last few years there has been local consultation on changes in the Calton Barras area of Glasgow and those of you who have visited the Barras will have seen the new paving to roads and footways. There are changes afoot for the Gallowgate and London Road and on Tuesday 2nd October Calton Community Council and GoBike were invited to see what is proposed for the junction of London Road with Charlotte Street. Currently there is a pedestrian crossing set back from London Road plus a cycle lane that runs along London Road, which also has a crossing. The intention is to combine these two crossings into one, and importantly, have it showing a green light. This will only change to red when a motor vehicle (and we hope also a bike) is detected travelling north on Charlotte Street (which is one-way northbound). Should there be a big flow of traffic on Charlotte Street someone walking or cycling will be able to press the crossing button to return the pedestrian signal to green. If this works, and we hope it will, since the City Council’s intention is to prioritise active travel, it will have an obvious attraction to be used at other locations. Further to the Battlefield Consultation event on 4th September that our co-convenor Iona attended and that she reported on in Digest 18 item 1.4, we have now been invited to join the Battlefield Design Working Group. We are delighted about this and look forward to being represented at the group’s first meeting later this month. Give way markings for side roads along Northgate Road will be behind the continuous cycle route. Coloured screed is proposed along the cycle route at side roads junctions to highlight the presence of the lane. Tightening of radii is proposed at Geddes Road junction to calm traffic and assist crossing. Adding a raised table to calm traffic further and assist pedestrians is an option for consideration as part of the remodelling of this junction, though it would not provide pedestrian priority. Raised tables are proposed in other locations along the extent of the proposed route, where appropriate. Dropped kerbs are already in place at side roads along Northgate Road. Zebra crossings are proposed on Wallacewell Road. Signalised crossings on Broomfield Road are proposed due to the relative positions of the school/mini-roundabout. There is scope for possible future widening, in places, if required, although some sections are constrained due to overall road width. There are no reductions in cycle lane width on the Northgate Road and Stobhill Hospital link sections, but some localised narrowing is required at bus stops elsewhere along route due to cross-sectional road profile geometry. There are no plans for continuous cyclist access over existing bridge as part of the currently proposed phases. Resources for the feasibility study into bridge upgrade/replacement over the railway are still to be allocated, but it is intended that the study be completed during this phase of works and that any potential upgrade/replacement would then be a separate follow-on phase of works. The existing pedestrian route width will be retained (approx. 2 m along Turner Road and 3 m along Cobden Road). A separated, delineated 3 m bi-directional route along both sections is proposed for cyclists. The Sighthill TRA includes a signalised crossing at the western end of Cobden Path. The crossing will be toucanised, providing continuous travel by cyclists and pedestrians. The proposed specification for the Sighthill TRA Cycling Village is published at https://www.glasgow.gov.uk/sighthill. The Order was made on 16 August 2018 and an advert was placed in the Evening Times on 21 August 2018 stating that the Traffic Regulation Order has been made. I realise that this may not be the outcome you wished for, however, this Order is purely experimental and will last no longer than 18 months. If the trial is deemed to be successful the process of amending the permanent Traffic Regulation Order will be started, allowing all parties to lodge objections. At that time the additional works in and around the Scottish Events Campus may be underway, with one of the planned outcomes being to reduce the congestion at the north end of the Finnieston Bridge, reducing waiting time for all users, but I am, at present, unable to provide you with definitive details of the planned works. What we aren’t told is how the City Council will measure whether the measure of allowing all taxis to use the bus and cycle lanes, is successful, so when we thank them for this reply we will be asking that question. Thank you for getting in touch and apologies for the delay in getting back to you. Your comments and response has been added to the thousands of responses we have received to the George Square consultations. Officers are currently in the process of reading and summarising the comments and hope to produce a report in the near future. I hope this is of assistance to you. 3.13 Sunday’s GoBike ride, Cycling in Govan, towards the Airport and Jura Street. The highlight of our ride on Sunday, the refurbished fountain in Fountain Gardens in Paisley – always something to delight on a GoBike ride! Well done to Andy Preece our ride leader, for finding not only this but the Paisley Horseshoe. On Sunday’s GoBike ride, braving the wind and rain, eight intrepid souls set off from Bell’s Bridge to Kilmacolm. On the way, we cycled along Summertown Road in Govan, the subject of consultation some years ago. Travelling west there is now a shared footway on the south, which crosses to the north side, made very unsatisfactory with streetworks, before going on road as far as Broomloan Road. We then made our way through Elder Park before crossing the main road, the A739, via the underpass, to travel south over the motorway to Cardonald. As we bumped down kerbs from a very narrow footway to cross Shieldhall Road, one of our group commented that “It beggars belief how bad the facilities are.” This, the QEUH, is a jewel in the crown of the NHS, but we have never had a positive response when we have asked for good quality cycle and active travel provision. In Paisley, we saw signs leading towards the airport, but we were not overwhelmed by the cycle facilities we saw. 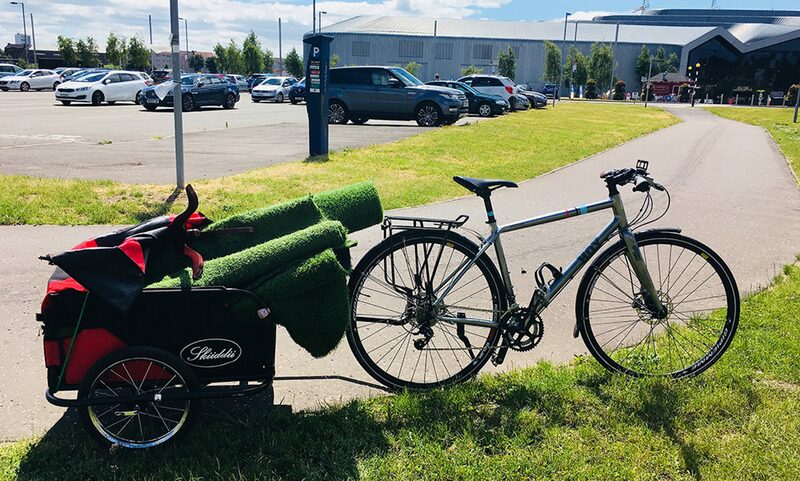 The intention on our return journey was to look at the cycle lanes on Jura Street, just off Paisley Road West, opposite Bellahouston Park, but nothing has yet been done, despite the consultation being held in March this year. This was a bit of a disappointment but we look forward to an overall Paisley Road West scheme! Lots of feedback there, the dialogue continues!